He does whatever a spider can! Sideshow is proud to present the Spider-Man Miles Morales Premium Format™ Figure. The Spider-Man Miles Morales Premium Format™ Figure measures 17” tall, as Miles vaults over the gaping jaws of the villainous Ultimate Venom. As the sinister symbiote tries to take a bite out of the teenaged hero, creeping purple tendrils and a monstrous pink tongue curl upwards to snare the Ultimate Spider-Man in this terrifying trap. With his spider-like agility, Miles Morales leaps into action with his distinct spider-style. 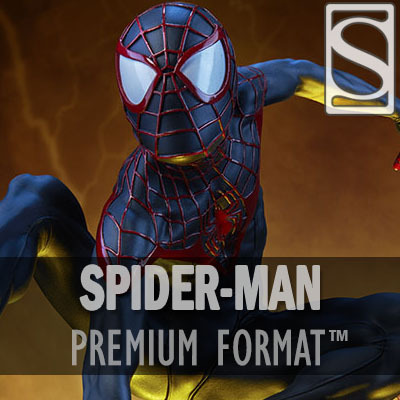 The polystone figure has a sculpted sleek black costume with raised red webbing details on the head, shoulders, and gloved hands. Miles’ striking suit has the classic Spider-Man symbol on the chest, with his own unique logo displayed across the back. His mask also features the iconic white eye lenses seen across the Spider-Verse to hide heroic identities.